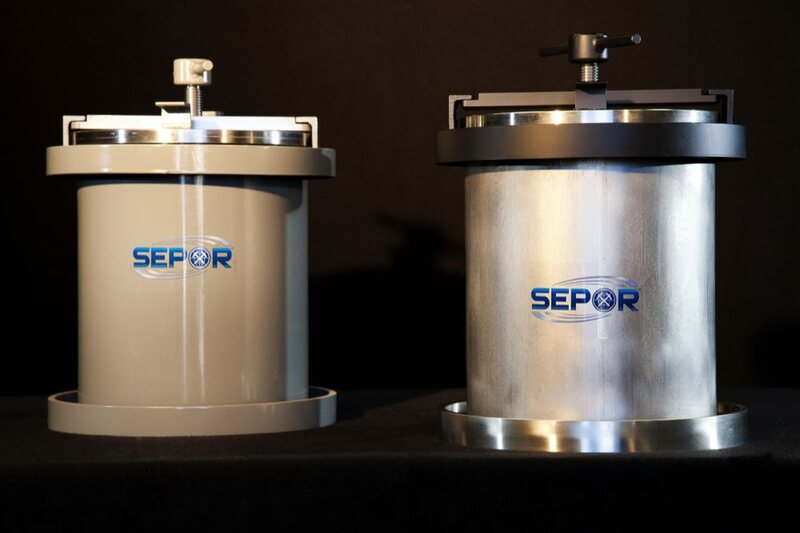 Sepor’s batch ball and rod mills are designed to give size reduction of laboratory quantities of minerals and ores. Feed size should generally be -1/8″, for ball mill and -1/2″ for rod mill. They are of a sturdy, rugged design to handle frequent use with hard materials. The batch ball and rod mills require a drive roll to rotate the mill the proper grinding speed, usually 60%- 75% of the critical speed for ball mills and 50% to 90% of critical speed for rod mills. The batch ball mill should be run between 56 RPM’s and 70 RPM’s. The batch rod mill should be run between 47 RPM’s and 79 RPM’s. Sepor has two series of drive rolls, one (recommended for these mills) is the 5″ diameter roll drive rolls, and the other has 2″ diameter drive rolls. Both drive rolls have variable speed drives, for operating the mill at the desired revolutions. Either wet grinding or dry grinding may be conducted in the batch ball and rod mills. Usually, wet grinding is more efficient than dry grinding, however in laboratory operations, adding liquid is not feasible. The jars should be charged with at least 20 pounds of balls (or rods for the rod mill), and 25%to 40%, by volume, material to be ground (1.4 liters to 2 liters). The batch ball and rod mill consists of the grinding cylinder with four lifter bars, machined rolling rings, threaded removable yoke, hand lever for tightening and loosening the lid, a machined lid with neoprene gasket.